Anyway, purpose of this post was a discovery in a local department store the other day in the cookbook section - those I do have in quantity... A foodie of many years, I cannot resist a good cookbook, and have just indulged in the purchase of Yotam Ottolenghi and Sami Tamimi's Jerusalem - and this, for those with a taste for Middle Eastern food, is an absolute must. The photo below is the mixed bean salad (absolutely stupendous vegetable section) I made to go with our trout for last Friday night's dinner. DB came into the house salivating - he said he could smell the roasted whole spices in the warm dressing as soon as he came out of the lift! I digressed. Food - and books - will do that to you! The department store discovery may be of particular interest to Peter over at Kyusireader...who is a mad Penguin book fan. He's just been collecting the new Penguin editions of all the John Wyndhams - while lusting after my vintage Penguin copies. And if you check out his blog, you'll find many posts that go back to his love of Penguin books, which he buys in batches when he finds them... So Peter, this is for you - as I seem to recall several enthusiastic notes about various edibles as well - Penguin Australia, in their trademark classic orange covers, have brought out a range of cookbooks by Aussie chefs...you're going to want these....! How cool. I read in the Guardian that penguin have done cookbooks with the little penguin logo holding a knife and fork. All this reminds me of a conversation with daughter about books versus digital readers to which she responded to the effect of: no books will be around for a while hipsters won’t let them die out, I am always seeing hipsters with an espresso, a cigarette and a penguin. At which point she smiled and I asked what was funny and she said: just had an image of hipster, coffee, cigarette and a real penguin sitting opposite. She then added ‘waiter bring me another penguin while they are still cool.’ Now I can’t get the image out of my head. 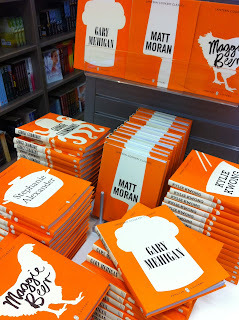 Will have to check these out next trip to the book shop. That's funny - good to know I"m not the only one whose brain does mad associations and visualisations!! Aieeee!!!! I'm booking my flight to Australia now! Hehehehehe. I am drooling over these Penguins! Why oh why should you feature this?! Now I won't be able to sleep thinking of these Penguin editions! The salad looks extremely delicious! Something light yet very tasty, I presume. 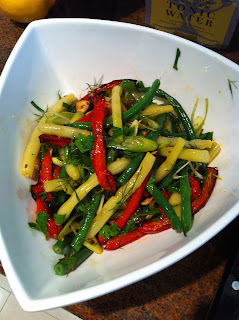 The salad was gorgeous - light and fresh, but eearthy and rich with the whole roasted coriander and cumin. I can email you the recipe if you like...let me know. Hi, Kaz! Yes, I would love to have that recipe! Thank you so much! Never enough room for books!